Tour extraordinary historic homes and gorgeous gardens as Pasadena Heritage presents architectural and landscape design spanning more than 8 decades. Tour guests will experience noteworthy architecture and landscape design that influence each other and combine to create perfect harmony. From “curb appeal” to private interiors, visitors will enjoy places that clearly demonstrate the beauty of indoor-outdoor living blended seamlessly together. Prior to the tour, on Thursday, March 28that 7:00 pm, Michael Logan, Busch Gardens researcher and historian, will speak about Pasadena’s historic Busch Gardens. Industrialist and co-founder of the Anheiser-Busch Corporation, Adolphus Busch, and his wife Lily, bought a winter home on Orange Grove Boulevard in 1904, and immediately began working with a prominent landscape architect to beautify their property. They installed rare and exotic plants and trees, created fanciful water features, and turned the floor of the Arroyo into a botanical wonderland. In 1905 they opened their garden to the public, and Busch Gardens became a major tourist attraction until its closing in 1938. In his presentation, Mr. Logan matches historic images to their same exact locations a century later. The lecture will take place at Maranatha High School, 169 S. St. John Ave., and free parking is available. Oakland, California–based Endemic Architecture’s most recent exhibition, Mind Your Mannerisms, at Jai & Jai Gallery in Los Angeles, examines the existential meaning behind San Francisco’s variant of the Victorian turret, what the firm refers to as one of many “architectural darlings” that populate our world. 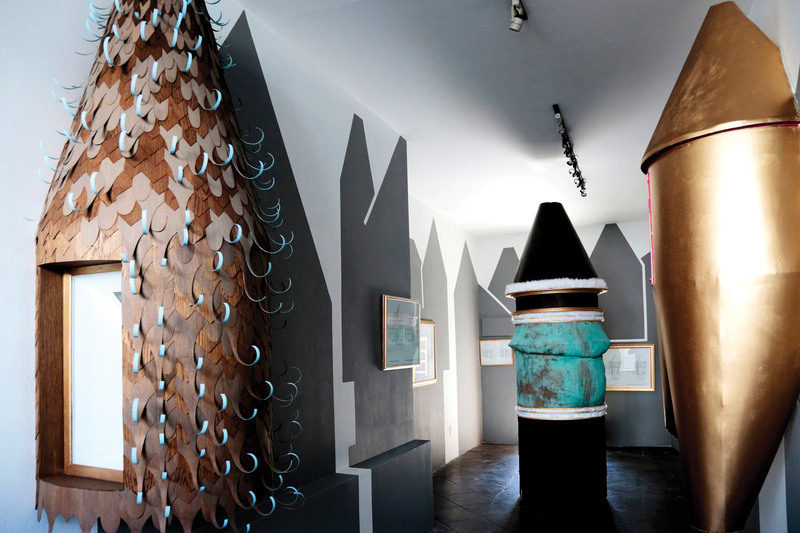 In Mind Your Mannerisms, the selected “darling”—turrets—is poked, pinched, and puckered in an effort to not only lend a sense of intellectual rigor to its whimsical forms, but to also induce new layer of new meaning and understanding resulting from the anipulation of its symbolic, anachronistic geometries. The firm utilizes collections of contextual photography showing the diverse manifestations of the turret typology in San Francisco’s built environment as a starting point in order to generate generalized drawings of particular, observed tendencies. In the process, the darling gets redefined from an object made up of discrete architectural components into a collection of quasi-digital surfaces where a series of formal maneuvers have been applied to two disparate objects: the turret itself and the so-called “Victorian” building to which it is attached. The firm uses these guiding considerations to generate interventions enacted upon a handful of existing and observed turret types, focusing on these aspects of each and amplifying or deforming their found conditions. These interventions are initially explored through a series of beguiling, shaded line drawings, side-by-side comparisons of found and manipulated elevation views displayed in gold-painted frames. The turrets take on the formal ambiguities of M.C. Escher drawings, as cornices become tangent to and sweep around rounded corners, conical roof forms loft to meet simply sloping ones and sections of walls are deleted or extruded up and down the form. Shingles and siding are along for the ride, too; they are scaled, alternated, and shifted accordingly. The drawings are then taken into three dimensions via three large, ambiguously-scaled maquettes. Two of these objects are installed directly on the gallery walls, which have been painted with the black silhouettes of generic Victorian building forms. A third form is freestanding, its bulbous and rumpled masses sagging in an exaggerated, Pablo Escobar–style paunch. The turrets are lent a scale-less distortion by the firm’s use of repurposed, full-scale turret windows salvaged from recently-demolished structures in the models. The relic windows, one with panes fritted, the other with a set of secondary, chamfered interior surfaces located just inside the window frame, again obscure the true nature of these sculptural objects. Is each one actually a turret-shaped building? Are they one-to-one mock-ups of diminutive turrets? It’s hard to tell, but that’s partially the point. This transformation from orthographic drawing to object-in-the-round gives each turret conflicting, multiple meanings, as the physical properties of their material components clash with one another. One wall-mounted turret is clad in sheets of woodgrain veneer, cut out and styled so their ends curl up. The freestanding turret is topped with a tiara of faux-fur. And if we can look past the Seuss-ian forms the turrets take and look at them for what they are—geometric abstractions—something clicks into place: Thenhaus and his team are using San Francisco’s turret as a learning tool. By imposing an order and then manipulating that order, working to generate new forms that still fit the decided upon definition for what a turret is, the designers lend clarity to something that is otherwise shrouded in mystery. The question is: Are the new creations Victorian turrets, still? It’s hard to tell because Victorian architectural forms juggle many considerations simultaneously: They are typically proportioned in accordance with light and air, are aggressively ornamented, and do a great job of breaking down massive buildings into pleasant agglomerations of cute things like cornices,windows, porches, and yes, turrets. Victorian architecture makes no sense at all, however, from the point of view the rationalist, diagram-driven, methodology of contemporary practice that has been applied to its formal existence here. By subsuming the particularities of the Victorian ecosystem of styles in this way, the researchers point out the barren lexical memory of their profession and the ways in which building components, once discrete, measurable and observable objects, have been replaced in contemporary discourse with digital modeling processes and “if, then” reactions, in which collections of dots, lines, and planes are swept, lofted, tweened, and booleaned to generate form. In both cases, meaning results from the processes undertaken in order to generate form and not, as is the case with Victorian architecture, from the symbolic and physical properties of the forms themselves. Viewed through this lens, the works presented in the exhibition can be seen not merely as generative, architectural by-products begat from architecturally-focused observation, but as a part of that conversation in their own right. That is, Endemic’s turrets, with their quizzical proportions, jiggery-pokery of material, and side eye toward playful formalism are as helpful in Endemic’s attempt to define the turret typology as the observed turrets themselves. Chicago's historic Pullman neighborhood will become a national monument, perhaps putting it into the National Park Service's portfolio—the first Chicago property to receive such a designation. President Barack Obama is expected to name the Far South Side area a national monument during a visit to his adopted hometown next week, invoking his presidential authority under the Antiquities Act for the 14th time. White House officials said it is part of Obama's efforts to diversify the nation's collection of historic places. An analysis by the liberal Center for American Progress found fewer than one-fourth of 461 national parks and monuments had a focus on diverse groups. 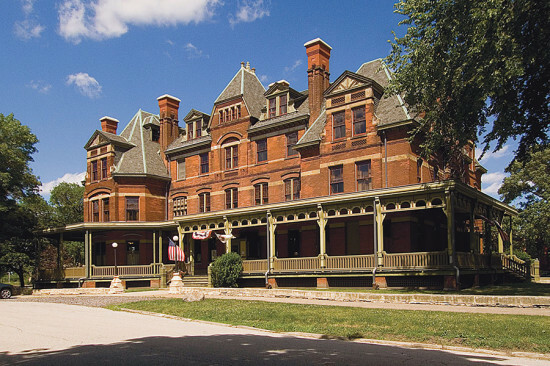 The home of Pullman Palace Car Co., which made sleeper cars for rail passengers, the Pullman area retains a collection of Queen Anne–style architecture left over from Pullman's worker housing and administration buildings. That collection is considered one of the country's first “company towns.” Once prairie land, Pullman became part of Chicago in 1907. An 1894 strike cemented its place in labor history, when U.S. marshals killed several workers participating in the country's first industrywide walkout. That strike led to the creation of the nation's first African American union, the Brotherhood of Sleeping Car Porters. Illinois lawmakers said in a letter to the President that Pullman “helped build the black middle class and laid the groundwork for the Civil Rights movement of the mid-20th century." The boundaries of the district will be 103rd Street on the north, 115th Street on the south, Cottage Grove Avenue on the west and the Norfolk & Western rail line on the east. 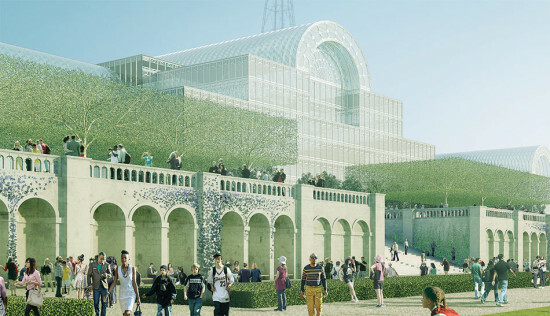 Plans have been revealed for the reconstruction of London’s famed Crystal Palace and its surrounding 180-acre public park after London's Mayor Boris Johnson, accepted an $800 million investment promise from Shanghai-based investors ZhongRong Group. Constructed in 1851 for the Great Exhibition in Hyde Park, a fire ravaged Joseph Paxton’s glass and cast iron structural innovation in 1936. Since then, the area has been mostly abandoned with even the sizable public green space around it largely unused except for temporary events. At the launch event last week, ZhongRong Group announced its funding plans and independent engineering firm, ARUP, revealed their renovation renderings and park design plans. Following the original Victorian design, plans for renovation will restore the Crystal Palace to its former glory with the intention that it become a cultural attraction for England’s capital city. Landscape proposals plan a 21st century update, yet are sensitive to Paxton’s style and the needs of local residents. The new green space will include Italian terraces, a tree-lined “Paxton Axis” boulevard connecting the palace and park to the city center, improved landscaping and lighting, a visitor center, a café, and a refurbishment of the existing concert bowl. The entire project is proposed for completion by 2018.